Whether you fly direct, stop off on a cruise, island hop or simply drive around the island, The Reef is easy to find. The Reef is conveniently located along the main road about half-way between Hewanorra international airport and the town of Vieux Fort at the south of St Lucia. Keep an eye out for the two offshore Maria Islands and you will find The Reef on the beach directly facing the islands. There are two airports in St Lucia: one in the north and one in the south. George F.L. 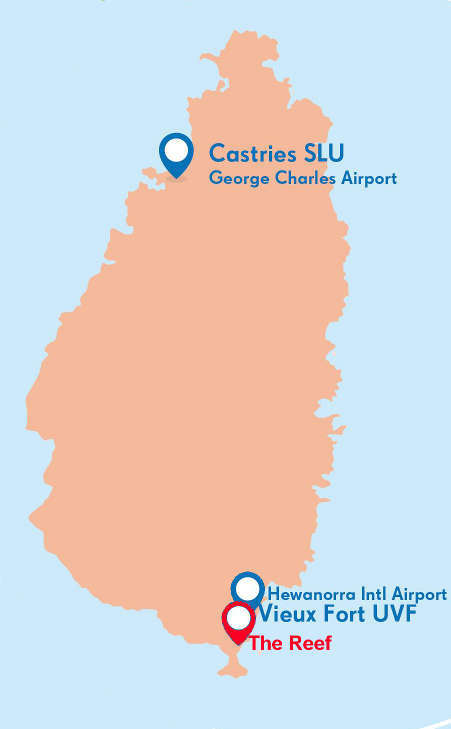 Charles Airport (airport code: SLU) is located just outside the capital city of Castries in the north of the island. Hewanorra International Airport (UVF) in Vieux Fort is located 40 miles south of Castries, just a stone’s throw from all of the action at The Reef. United Airlines from New Jersey/Chicago. Direct service from Montreal is available at peak times of the year on Air Canada and some chartered services. British Airways provides seven weekly flights, also direct from Gatwick. A weekly service is available direct from Manchester on Fly Thomas Cook and from Germany on Condor, at peak times of the year. Air: Departure tax is included in the ticket price for all passengers over 12 years leaving the island by air. Sea: For passengers leaving by sea, departure tax is payable at EC$33 or US$13 .